The story follows Kuroemon and his exploits in the newly-ruled baseball in the Japan of the 22nd century, where the use of Doraemon’s special gadget is available up to 3 times every match and the gadget is decided at random during the beginning of the game. Kuroemon seeks glory with his team, Edogawa Dora’s, as they are yet to have a single victory. And, what do I think of it? 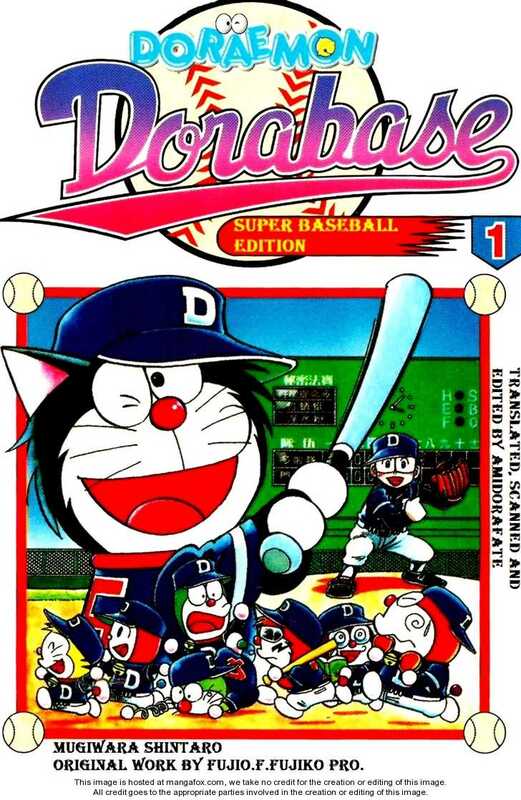 It is marketed as the spin-off from the Doraemons’s original manga, much like The Doraemons, where it featured 6 different Doraemons to work with Doraemon on their adventure, and the genre of this manga is now sports where it featured my favourite sport, Baseball. And with the addition of special rules where the usage of gadget is allowed up to 3 times per match and the inclusion of magic-balls and special moves, it becomes more and more exciting. Is there anyway that they can screw this great setting? It's take on baseball matches are unique. Dorabase spawned a sequel, titled Shin Dorabase. I am going to review both of them separately in different post, with the original Dorabase the first one reviewed and the Shin Dorabase the second one in order not to cause much confusion. Here we go. Before beginning, i wanted to include many scanned pages from my collection, but i lacked the device to do so, and even if i did, it is translated into my language. And also, finding them in internet are also hard. Dorabase was great when it lasted. It endured a 11-year long, 23 volume publication, beginning at 2000 and ending at 2011. I read it with much love since I loved the series upon picking it up at 2006 when I was still a boy and loved reading it to this day. Unfortunately, as I matured up, I found more and more faulty everytime I re-read it. 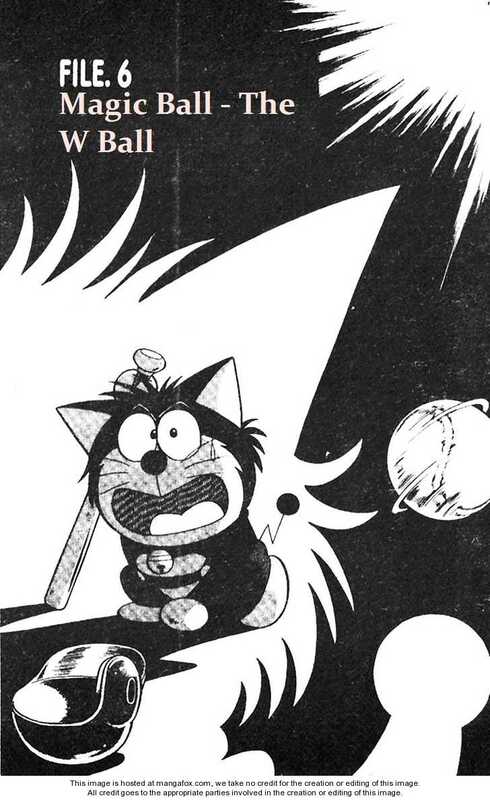 As I stated before, the setting was great, in the future where Doraemon came from, and where Baseball has been reinvented to allow the usage of gadgets and all, but the most suprising one is the inclusion of Magic Balls and special moves. For example, Shiroemon, the rival of our protagonist, Kuroemon, has a W-ball where the ball shapes like the word W when it was thrown, before developing it’s variety. And of course, to counter this, Kuroemon created a special move to hit that ball, a Daikon-Slicing Full moon strike (I know it’s hilarious), where he jump and hits the ball like he is hitting a fruit with a sword, hence the name Daikon-Slicing. Was that move allowed? I don’t care. It was cool. Moreover, the gadgets usage were cool when it was used. Can you imagine stopping a fine home-run using a Bamboo-Copter? Or using the Forgetting Flower to make a pitcher forget how to pitch, it was really creative and interesting whenever this kind of thing happened. So, there is nothing wrong with the settings right? What about the characters? by reading the series, Hiroshi the pitcher and the only human in the playing team of Edogawa Dora’s, Hyoroemon, Gurimeon who later left, Chibiemon who replaces Guriemon, Pakuemon, Toraemon, Aimond who is an American, Suzuemon, Pyokoemon, Mikeemon, and Mika-chan who is the manager of the Edogawa Dora’s. There is nothing wrong with the characters of the Edogawa Dora’s as everyone, excluding Mika-chan, received their own character development moment. Next is the Whiters where we are also treated with another 9 member, but only three receive development, which is the aforementioned Shiroemon, Komatsugawa, and Hirai. Then we later had Dora-Ichiro of the Boso Turtles, Pokoemon of the Yamadera Bear’s, Emoll of the Akane Flyers and many more. For a sports manga, to be inhabited by a lot of character is no surprise, but this one is too much, to the point the manga get overcrowded and still introduces more character, and they all are treated as “Just another Kuroemon enemy that he needed to overcome” or the sort. Kuroemon, standing as the protagonist of the series, is the most developed and fleshed out character in the series. He has the drive to lead his team to glory, his background for why he wants to be the best, and his growth to be a mature player. Shiroemon stands as the close second here. And lastly, it was Monta, which we'll get into later. Kuroemon and Shiroemon are the most fleshed-out character in this series. And of course, tournaments are pivotal in the sports manga right? Unfortunately again for Dorabase, while they delivered in the first and second tournament, they totally ruined it in the third and the fourth tournament. Tournaments are much like plots here so I think we’re going to cover it by the end of reviewing each tournament. First, we are treated with the First Big-Dome Cup and coincidentally, Edogawa Dora’s first tournament run after their first ever victory. Knowing that his team won’t last in such a big tournament, Kuroemon developed a very interesting training regime, where he shipwrecks his team into an uninhabited island for a month with nothing but baseball equipment and seeks to survive using them. It was cool on paper and great upon realization, as it leads for some great bonding moments with the team and great training regime, and of course, Edogawa Dora’s grew into a competent team after this.The first tournament was really great and exciting, as we are treated with the introduction of Pokoemon, Dora Ichiro, and later Shiroemon. Pokoemon and Dora Ichiro are, unlike any other rivals later, never treated as just another Kuroemon rival and received their character development later in the story, while Shiroemon receives his in this tournament, which makes Shiroemon more affectionate and symphatetic for some reason. Dorabase also nailed with the Kabutomushi cup, or the second tournament, as they are finally glorious in this tournament, defeating Akane Flyers, who beaten Shiroemon’s Arakawa Whiter’s early in the cup. When Edogawa Dora’s defeated Akane Flyers against all odds, where Emoll uses all tactics in his disposal to defeat Edogawa Dora’s yet it fails spectacularly in his face, Edogawa Dora’s celebration were phenomenal and glorious, while Emoll’s defeat felt heavy. Emoll, at this time, was treated as a central character of the cup, as he places himself as a bet with his owner, where if he won the cup, he’ll be allowed to play baseball whenever he likes, but should he lose, he’ll succeed his owner’s as a CEO of his corporation. And much like other sports manga, upon losing, his owner realizes that Emoll had a fantastic potential as a baseball player and allowed him to do so. I liked Emoll’s owner, which was given before to Dora Ichiro, where he blantantly declared that he was “Made to make hits”. This raised questions later in the series as the robot-emons are treated more like a human and even produced blood and gained higher sentience. So where was that owner-robot relationship from earlier? Are all of them escaped from the facility? This was a plothole for me, to be honest. After this, and a couple more random games, which I treat as a spin-off, yet it introduced Retsu, who were treated as a star in one of this encounter, yet get left out late in the series. 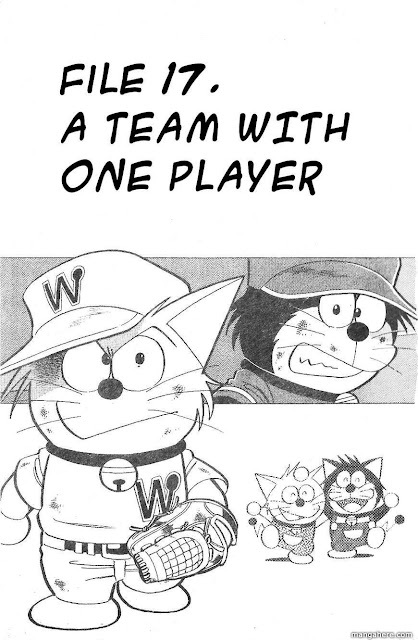 Then we enter WABC, an international tournament, common trope in a sports manga, and introduced one of the most memorable character in the form of King Sadaharu, a parody of a real-life player of the same name with the same record and batting-style as the real-life player. Sadaharu here is a motivated man who is strict, yet has a calm demeanor and prefers to use actions rather than words, unless it is for motivation purpose, which he does a bit rare. Sadaharu leaves the management of the international team to Kuroemon as he deemed Kuroemon as their captain, and selects his team not because of their popularity, but their apparent ability, which was remarkable. What Sadaharu lack was his backstory for explaining his passion for the baseball which has endured this far. For the tournament, it was Hiroshi’s moment of character development, which he was lacking in the story earlier, where he had his arm broken and was unable to contemplate of not able to going to the tournament. His moment felt clichéd and weak, but his resolve was great to be honest. It also serves as Suzuemon’s launching pod, as he was one of the most underrated character in the Edogawa Dora’s. Aside from that, it launched Aimond into superstardom as he, playing for the USA team, was selected as the tournament’s MVP for his apparent ability to hit a constant home-run whenever he is playing. He was portrayed as a jerk first, yet it all reverts upon his return to Edogawa Dora’s. To be honest, WABC had a problem here and there. Of course, introducing a one-off characters here is not the problem as it is an apparent trope in an international tournament. The problem here lies with the ruling. It was stated at first that you can only use one gadget for the tournament and only once that time, but on the final, Japan and America uses 3 of them. Second, it treated several characters like a joke, like the newly introduced Kinuemon and Maji, who apparently has a good RBI yet does nothing notable, and Retsu deserves a mention, as he registered almost no hit at all during the tournament except during the Cuban game. Only Oreemon and Dora Ichiro, as well as Aimond, benefitted from the tournament, as Oreemon, the newly introduced character, makes several good hits and runs, while Dora Ichiro’s batting average was recognized here, while Aimond’s potent hitting ability is finally recognized internationally. And of course, the fourth tournament Edogawa Dora’s entered was also a disaster. The Japan Baseball Tournament, as called by Sadaharu, the organizer of the tournament, yeah he did this tournament. So, was he that rich or something? I don’t know, as there is no sponsors being mentioned in the tournament. He even offered the winning team a stadium. Do you know how much it is to build one? Moving on from that, Aimond’s ability to hit balls in this tournament were left for dead. He was hot after his exploits in the WABC, yet in this tournament, he is treated as a joke, failing to register a single hit, even to a lowly pitcher for some reason, and nobody bats an eye, except the readers I guess. This tournament for some reason introduced two more characters, four more if we add Pokoemon’s sibling. They are Monta of the Yamaoku Yamadera, who is definitely the best character in the Dorabase series yet he appears very late, and Iriemon of the Iriomote Mangrove. Iriemon is treated as another Kuroemon’s rival, while Monta here has a defining moment that makes him who he is. He gets the best development out of all the characters in the series and later receives his flashback backstory for explaining his apparent suspension from entering any baseball tournament. Also, unlike any other player, being a pitcher, he uses only a straight ball and is unwilling to change the ball, even when facing someone who is very potent at hitting a straight ball. That conviction was really great and of course, was backed by his backstory. That made him the best character in the series for me. Edogawa Dora’s second team also returned here as the Great Dora’s, who uses a Dragon Ball-style training regime, where they entered the tournament using a uniform that has it’s material changed into a lead. And of course, they were strong, but also treated as another Kuroemon’s rival, save for Bubuta, who had a major development moment here. At first, they cheated by intentionally making Edogawa Dora’s disqualified by trapping them inside a cage, but that doesn’t stop the Edogawa Dora’s from battling them. Their tactics was apparently the best in the series. First, they use intentional tactics on Aimond and Kuroemon, the best batter in the team. Intentional walks are perceived in the series as a cowardly tactic, yet it’s usage is widespread in a professional tournament, preventing players with high RBI or batting average from hitting a homerun. Their coach also employs a tactic which makes Bubuta, the pitcher, less exhausted, by predicting the balls that will cause an easy out for the batter. Their tactics were, while perceived as cowardly, were great and practical. That was the last tournament, before moving on to an all-star match, featuring many select individuals that participated in the tournament earlier, introducing YET ANOTHER character in the form of Mister Shigeo, who has no background or story whatsoever and is perceived as the shining sun of the japanese baseball for some reason, and a rival to King Sadaharu. I have no idea why he’s here and why not use Doranosuke instead? The Great Dora’s coach which I mentioned earlier in tactic but forgot to mention in name. And in this match, Hiroshi is finally being put against Kuroemon and has come far in developing his pitching, where he grow from using Fork balls, to powerful straight ball. Just great. Then, Monta and Kuroemon’s face off happened here for some reason, instead of their team going at it. That’s why Kuroemon’s victory against Monta here felt rushed. In my opinion, this match was made just for the sake of Hiroshi and Monta squaring-off against Kuroemon. Oh, I forgot to mention Drump, an American robot? Who is the owner of the Devil King’s who appeared in the volume 4. He was the villain here, who seeks at nothing but gathering the best players for his friend, but he lost to the Edogawa Dora’s. Drump’s moment came in the WABC, along with Aimond and there, it was explained why he was very ruthless on winning that tournament. There’s also Ronaemon, and Randy, and at this point, I am really lazy in explaining who they are. So there you have it, characters were abundant here and apparently, overcrowding the series. There’s so much, yet instead of utilizing them all accordingly in each tournament, the author opted to introduce more and more character, and had trouble giving them time to appear. When it should have been an established character in here, someone else instead popped out. I know that makes the series more exciting as Kuroemon gets more enemy, yet it populates the series too much with characters that made little sensed whatsoever. I don’t mind the secondary characters necessary for filling up the team, but the problem lies when the main focus of the team doesn’t get developed. Overabundance of characters plays a huge part in making the series looks bad. Plots were okay in terms of pacing. It’s neither slow or fast, and easy to understand, but there are one or two plotholes that you are bound to find upon reading this manga. For example is that robot-treatment and Aimond’s backstory, among other things. I don’t know whether this is only in my country or not, but the usage of baseball terms were bad here. First, they mentioned Intentional walks, then 20 volumes later, it was called “Kicking upstairs”, what is ‘Kicking upstairs?’ Then, instead of using Flyouts, it is called ‘Fine play’ here. Sayonara Home-run is acceptable as it is the japanese equivalent of a Walk-off Home-run. Also, I love how the author gradually learns baseball terms and using terms such as Passed balls when it was never mentioned early in the series, as well as Wild-pitches, and Pinch-hitter. Another problem that lies in this series is that how overpowered a named pitcher is. 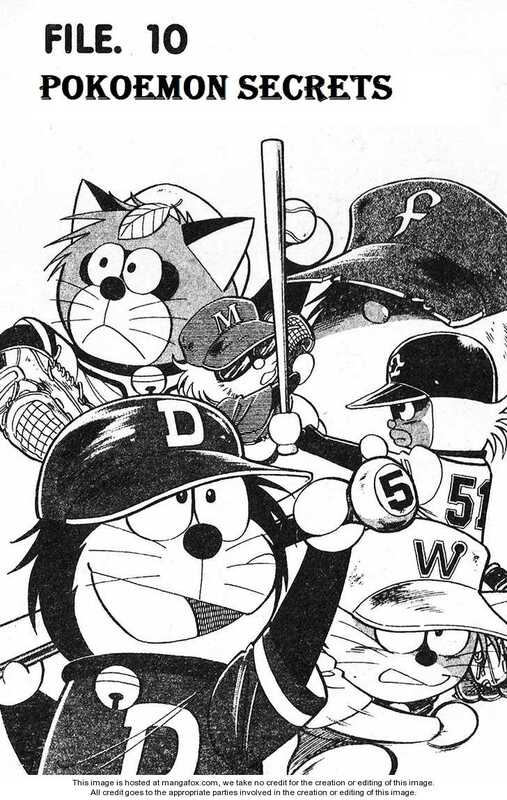 Emoll, Shiroemon, Drump, Pokoemon, and Monta are a great batter in addition of being a great pitcher, whilst Kuroemon cannot really pitch that well and Dora Ichiro can pitch, but his ball is not that good as he let several runners advance during the WABC. So, being a pitcher means you can be a good batter here while being a good batter doesn’t necessarily mean you can pitch well? I don’t know. Well, there you have it, this is a good manga series to be read, at first, but once re-reading it again, the problem becomes much more apparent, such as how abundant the character is, how there is so many plotholes in the series, and how the tournament failed to deliver. There are some good here and there, but due to the faulty at hand offered by the series, it failed to deliver big time. However, considering it publishes for up to 23 volumes, I guess it is a good seriesback then. I’m not saying it’s a necessarily bad series, but it is definitely not a good one to be honest. Any sports-genre loving fan are welcome to read this, due to the competitive sport being played, but casual fans can also read this series as the unique nature of each match draws in interested reader. The lovers of Doraemon series can also look forward to reading this as the gadgets here are utilized wonderfully, but Doraemon only appears twice in this series, both early and late, and as an icing in the cake, he was the one who coined the name Edogawa Dora’s . It was too bad Yamaoku Yamadera didn’t get to play with Edogawa Dora’s. The good : Matches played in a unique nature. Monta and Shiroemon are memorable. Surely keeps you entertained long-term. The bad : Overabundance of characters. Too many plotholes. Some matches don’t even make any sense. Most of the cast here don’t get developed that well. Highlight moment : When Edogawa Dora’s won Kabutomushi Cup. Edogawa Dora’s vs the Great Dora’s. Final Score : 2.5 out of 5. It could have been so much more. Note : Pictures are taken from the Mangaheat.com, all of them. Like i said before, i wanted to but i couldn't include my own scanned pages.